I remember back in the late 80’s / early 90’s (yes, I’m an old fart…) when every band and their f**king mother got a record deal and hard rock bands grew like weeds in your backyard. It was almost impossible to keep up and check out every band that came along – and I was a young and single guy back then with all the time in the world. Things have changed since then, but in the last few years, the same thing has happened. Today there are so many bands around – new bands, old bands and reunited bands and all of them keep throwing out records like it was no tomorrow. Good thing, though, is that most of them take three – four years in between records now – in the early 90’s, two years in between records was a long time. But as an older – but still a music geek – man, I now have a family, job and other responsibilities and just like back then, it’s impossible to keep up. So, I just have to pick and choose which bands I have time to check out and review. That way, some bands fall on the side which later might prove to be a mistake. One band that has fallen on the side here is Swedish Melodic Hard Rock band Degreed. I have known about the band’s existence for years now and I have friends who have pointed out to me that I need to check them out, but for reasons I wrote above, I never have. But when a link to download their new album popped up in my mailbox, I really couldn’t motivate not to give them a shot. The thing is, I never really doubted that Degreed were a good band, but I know of many bands that are good, but still kind of uninteresting. And for some reason, I put Degreed in that category. I mean, I have heard the odd song or two in the background once or twice and they never stuck – not that I gave the songs a real chance. But now it’s time to do just that. So I plug in my earphones, push play and let opening track “The Scam” assault me – and it does just that. I’m quite stunned – is this what I have put aside and called “not interesting enough”? It’s a killer track, Melodic Metal with progressive undertones that rocks me all the way home. I don’t know if anyone is familiar with Finish rockers White Flame, but for you who are, this song bears resemblance to their latest album Cougar. Ok, I’m interested now – really interested. “Face The Fact” isn’t as heavy, but still rocks and has a fantastic melody, catchy as Hell with a pop feel that should give them interest outside the metal community. Not cheesy at all, though. With “Madness” they keep impressing me. I’m thinking about a more pop version of Dream Theater without the too progressive vibes. It’s very melodic, heavy on the keyboards and an amazing melody. “Shame On Me” is very unpredictable, it mixes soft with aggression – it has a major pop feel, but also some real heavy parts that are really Metal – this is amazing stuff. You want a hit? Say hello to “Better Safe Than Sorry”. Wow, man. This has to be the most striking refrain I have heard in many a moon. Song writers like Desmond Child, Diane Warren and Max Martin would sacrifice their first borns for a chorus like that. This is pop metal at its best and I hope this will be a single because this must become a hit. Like the disgusting hamburger “restaurant” says in the commercial – I’m lovin’ it! “Love Me, Love Me Not” is a rocker with a ballad-like melody, but it’s not a ballad at all. Makes sense? No? Not to me either, but that’s the only way I can describe it. It’s one helluva song, no matter what you call it. “Drama” is a cool little pop song, still on the heavier side with some aggressive vocals and I’m thinking that this album keeps taking turns that makes it unpredictable all the way. Same with “Kill Your Darlings”, it’s heavy, almost Metal, but with a big twist of pop. “Touch Of Paradise” is more standard Melodic Rock / AOR – it has a typical 80’s melody but the foundation is more of the modern kind. But not modern as in American radio rock or metalcore, modern in a good way. But the modern radio rock thing do show up here in the shape of “Forgive You”, but the song is really good so I let it slip and still, the core of the song is really catchy hard rock. The progressive influences comes back in “Start Again”, but the tune is really a catchy hard rocker with a punchline to die for. Remember Canadian AOR rocker Aldo Nova? Well, he hasn’t done anything in years and years, so it’s really nice to hear a big Aldo Nova influence in the keyboard arrangements in “Firefly”, a brilliant 80’s sounding AOR tune. “The Final Ride” don’t mess around one bite – this is a straight up rock song, no more, no less and actually the one of its kind on this album and that makes it stand out. There are no ballads per se on this album, but closing track “Turn Around, Don’t Back Down” is the most ballad-like tune on the record. It has a darker mood, but it’s still very melodic and it is a great song. Degreed is a mistake for me. Well, the fact that I never bothered to check them out, that is. I still haven’t had the time to check out their earlier stuff, but judging by this record I should have sunk my teeth into this band ages ago – this is a really impressing album and another big musical surprise for me this year. 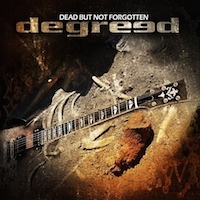 Degreed are a melodic Rock / AOR / hard rock band, but it doesn’t stops there. They mix their influences with progressive rock, Metal and Pop, but never lose the base that glue everything together. Also, the band – Robin Ericsson – bass, vocals, Daniel Johansson – guitar, Mikael Jansson – keyboards and Mats Ericsson – drums – are all really good musicians and the production here is really awesome. It’s heavy, but shimmering and has a velvet like sound scape. The only thing I might object to is that the keyboards has a tendency to take over and the guitars are a little too low in the mix. Other than that, there’s nothing to pick on at all. For every Melodic Rock fan, this album is a given buy. Degreed – good, but uninteresting? Not a chance.